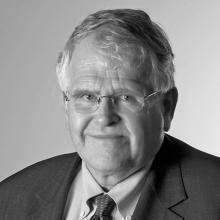 Russell R. Wheeler is President of the Governance Institute and a Visiting Fellow at the Brookings Institution. The Governance Institute is a non-partisan think tank that assesses barriers to effective governance. His current focus includes legislative-judicial relations and immigrant adjudication. Prior to joining the Governance Institute and Brookings, he served the Federal Judicial Center from 1977-2005, including as Deputy Director from 1991. He was a Senior Staff Associate at the National Center for State Courts in 1976-1977; a U.S. Supreme Court Fellow and later research associate in the office of the Chief Justice’s Administrative Assistant in 1973-1976; and an Assistant Professor in the Department of Political Science at Texas Tech University in 1970-1973. Wheeler holds a Ph.D in political science from the University of Chicago and did his undergraduate work at Augustana College in Illinois. Wheeler is a prolific author who has authored dozens of books and articles on the federal courts; judicial independence; judicial selection methods; judicial education programs; judicial discipline; and judicial administration. He is an Adjunct Professor at Washington College of Law at American University. He coordinated the research support for the federal courts’ Judicial Conduct and Disability Act Study Committee (known as the “Breyer Committee”) and was a research consultant for the Commission on Structural Alternatives for the U.S. Court of Appeals and the Committee on Long Range Planning of the Judicial Conference of the United States; a Reporter for the Federal Courts Study Committee. In addition, he was a member and president of the Board of the Justice Studies Center of the Americas in Santiago, Chile (created by the Organization of American States), a member of the U.S. Supreme Court Fellows Commission, and the Board of Editors of the Justice System Journal (serving earlier as Editor in Chief). Formerly, Wheeler was a member of the IAALS Board of Advisors.